Reverse Brainstorming: How can the problem get worse? A few months ago Margaret Keefer, a Professional Development Specialist in our district lead us through a Reverse Brainstorming Activity for our Professional Learning Communities. She asked us to list all the things we could do to allow ineffective PLCs in our district. At first I was puzzled by the request. I was thinking to myself, “You want us to say how we can continue to allow ineffective PLCs?” So I began to write as many ideas as I could think of and when we shared out I could see how this information would eventually work to help the process! The ideas we listed ended up informing our solutions! We did this activity with about 100 staff members from from teachers to paraprofessionals, secretaries to guidance and administration. The feedback from the process was very insightful. Staff members were able to be honest (and vulnerable) by listing all the things we could do to basically make the hallways worse. The activity was a good starting point for us. 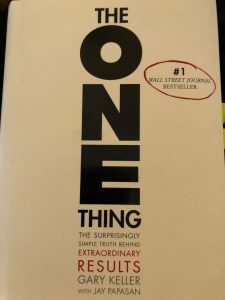 I was recently talking with the Transformative Principal Podcast host Jethro Jones and he recommended reading The One Thing: The Surprisingly Simple Truth Behind Extraordinary Results by Gary Keller. He recommended that I read The One Thing to help me personally and professionally. I am very grateful for his recommendation! 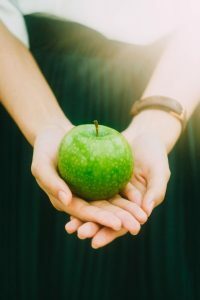 Personally, the One Thing requires you to answer a seemingly easy question, “What’s the one thing I can do such that by doing it everything else will be easier or unnecessary?” The beauty of this question is that it is not very easy. Thankfully, the book assists you with a process of determining that One Thing and then putting it into motion. For me, I analyzed my morning routine. I have been keeping a Gratitude Journal and mediating for about a year and a half. This routine has helped me in many ways and I have been very dedicated to keeping this going. According to Gary Keller, it takes about 66 days to create and implement new habits. Here I thought I was being disciplined, but if you read the One Thing you will learn that discipline is a bit of a myth. In all honesty I had one thing going but what was leading up to that one thing (the Gratitude Journal/Mediation) was not helping. Like many people today, when I woke up I was immediately going on my phone. At first it was to check some messages and then 30 minutes later I have checked email, LinkedIn, Instagram, Facebook and Twitter. Then I would be rushing to get into the shower and afterwards speeding through my Gratitude/Mediation. This was not working for me. 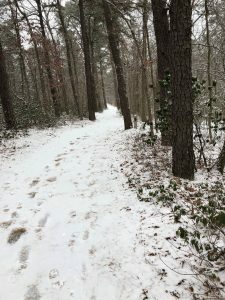 I decided to cut out my phone from the morning routine and get out the door for a walk. I love walking (really wish I could run but that is another story) and I felt that if I got out of the door and started walking everything else would be easier. I wouldn’t end the day looking at my step count only to be disappointed. I wouldn’t waste time in the morning on the various social media apps. I would have already accomplished something and that would make everything else easier and unnecessary. I am only a few days into implementing the One Thing in my personal life. I have many days to go to get to the “sweet spot” of 66 days. Yet, I can already see changes! Professionally, I implemented the One Thing into our School Improvement Plan for next year. I will be following up on a post about this shortly. In the meantime, be sure to check out the One Thing and be ready to get extraordinary results! Life will constantly teach you lessons even when you don’t realize it. Using mindfulness on a daily basis can assist with life’s challenges and celebrations. There are many resources out there to assist with the daily practice of mindfulness. This is my humble attempt to share what helps me and what others have suggested. Take a daily temperature of your mindfulness. If you use a scale (like 1-5) how would you rate your day? A follow up question to that would be ‘what would have made it higher?’ Be sure to do this in a non-judgmental manner. This activity is designed to help you track days to maybe identify trends. For instance, if Mondays are always tough, this could give you an opportunity to focus on being pro-active when Monday rolls around. Daily gratitude list. 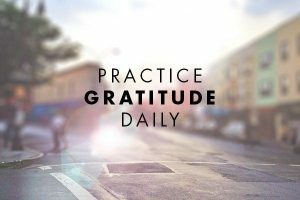 Either in the morning or the evening be sure to identify at least 5 things you are grateful for. This could be a simple thing like sunshine or more specific. It’s your list so you can write whatever you want. Use your heart. It is very important to exercise and get your heart pumping. Another activity to get your heart going is meditate on your heart. Are there people in your life that you want to send love to? These people could be family members or friends, and it could even be people you disagree with. Send love for healing! Get out of your head. Thinking, over-analyzing and catastrophic thinking (thinking the worst case scenario) will not get you very far. If you find yourself in your head try to do something to get grounded. Grounding activities include working out, meditating, cleaning, listening to music or even talking with a trusted friend. Whatever “story” you are telling yourself has to be let go. Maybe just changing your perspective on the story could help. Tell yourself that whatever you are worrying about as already happened. Whatever the outcome it is important to remember, you can not control it. You can only control your reaction. Stop judging yourself. We can be the toughest critics on ourselves. This doesn’t help our mindfulness practice. You have to forgive yourself for mistakes, accept how you look, and send yourself love. Similar to number 3 (send live from the heart) it is imperative to send love to yourself. Do you have any mindfulness activities? Be sure to comment and share your ideas. I want to start out by expressing my sincere condolences to the community of Parkland, Florida. This tragedy has not only impacted the community of Parkland, Florida but also all of us who work in schools in the United States. This post, however, is not about the politics, mental health or gun debates that are currently filling up social media networks as well as local, state, and national news. 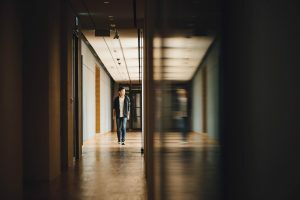 This post is about the seriousness of school security and the reality of being a principal having to deal with it. No where in my Principal training was there a class or certification for school security. We discussed ideas, argued about the difference between being managers or leaders, and developed a leadership platform. We learned about school finance, researched best practices for curriculum and instruction, and wrote papers about the schools of the future. Honestly, this is what what should have been doing as aspiring school leaders. However, throughout my experience as a teacher and guidance counselor, vice principal and Principal we have spent a lot of time discussing school security in professional development. I have learned from some of the best local law enforcement officials about how to keep a school safe and how to deal with tragedy. I’ve read countless articles on how to make a school safe and proactive approaches needed to ensure school security. For some reason, schools are a target and we are required to act accordingly. None of us wants to do the security drills but we do because we are committed to keeping kids safe. We take this aspect of our job very seriously. Security drills are nothing new to education. In some form or fashion we have been doing fire drills, bus evacuation drills, safety drills, nuclear war drills, and depending on the region there are countless weather related drills. After the Columbine School Shooting, schools began implementing active shooter drills, shelter in place, lock downs and evacuation drills. No matter the drill, teachers and students take these exercises seriously even as they may occur at any time. It has become part of what we do. As I watched the news reports from the most recent incident in Florida, I felt a deep emotion for those involved. 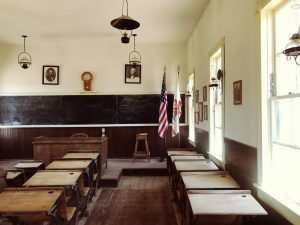 I couldn’t help but to ask myself the question, “What if that happened at my school?” Honestly, if you work in a school in the United States, you asked yourself that question. The answers, I am sure, would vary. It made me think about an incident that hit close to home. Prior to the Winter Break, our school had a “shooting threat” that turned out to be a vicious rumor fueled by misinformation, judgement and hysteria. We went through our protocols, included the local police, did thorough and extensive interviews only to find out there was nothing… no threatening posts on social media, no guns at the student’s house, no written accounts, not even a confirmed one on one conversation. We informed the teachers when were allowed to and we informed the parents when we were allowed to. Honestly, as I reflect back on this experience, all I think about are the parents and community members who rushed to judgement, pointed the finger at us and insinuated that we were not doing our jobs. The feeling I felt was that people actually thought it was our fault and that we were not doing enough. That hurt the most. As a parent and an educator I understand the emotions behind this entire debate. No one wants to send their children to a war zone, they want their kids to learn to read and write. This is why we practice drills. This is why we take threats seriously. This is why we investigate. This is why we involve law enforcement. This is why we are constantly being trained, and re-trained on crisis management. This is why we work together. When it comes to school security we take this very seriously. As a leader do you struggle with being visible? Is it difficult to be everywhere at the same time? Frustrated that the cloning software hasn’t kicked in yet? If you answered yes to any or all of these questions, we are in the same boat! I am fortunate to be teaching a graduate class at Rowan University this semester titled Education Organization and Leadership. One of our recent assignments was for the students to interview an administrator about the management of the building. The students wrote such compelling accounts from their interviews and inspired me to reflect on my own practice. I am so grateful for their inspiration! In my first Principal position I rarely was concerned with my visibility. I was the only administrator in a building with 320 kids and about 40 full time staff during the day. There were 3 floors and about 22 classrooms. The front office and my office was connected by a sliding door. Moving throughout the building was relatively easy, and I was able to check in with staff on a daily basis. This was my life for 5 years. 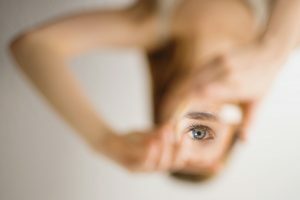 Believe me, there were difficult times and I am sure that amnesia has kicked in regarding my perception of visibility, but for the most part this was my world. Fast forward to now as I get closer to my two year anniversary at Lakeside Middle School. I struggle with visibility. I am the building Principal with 3 vice principals, 120 staff during the day and 1,100 students with over 75 classrooms, two floors and 10 hallways. One hallway is literally a 1/4 of a mile. It is an exciting building to work in and there is never a dull moment. We use the McREL Walkthrough system and I was able to go back through to see how many walkthroughs I have completed in the past two years. I have done 205 classroom walkthroughs. In that same time, I have formally observed about 75 staff with an average of forty minutes (some with pre-conferences and all with post conferences). I have attended about 25 PLC sessions. We have had monthly staff meetings, subcommittee meetings, department meetings, and about 10 Professional Development days. In addition, I have done about 160 cafeteria duties (very few this yer) and have been out for countless class changes. I spend almost every morning and afternoon in the front of the school directing traffic and directing students. According to my SAMs data, since October of 2016, I have worked about 2,300 hours. In 2016-17, I spent 53% in “instructional” time as compared to this year where I have spent only 40%. In both years I have spent about 30% of the time in “management” and about 3% in personal time (I rarely take lunches). Each year I average about 17% in “unscheduled” time which is basically me having difficulty recalling what I actually did. Honestly, the people who have said these things are not saying them in a mean or attacking way, but as someone who is constantly reflecting, it bothers me…. alot! Since this has been bothering me for quite some time I have already begun to address the problem. Honestly, no one cares about the data I shared above. It doesn’t matter how big or small the building is, or how many walkthroughs or observations have been accomplished, if I don’t feel visible, the staff surely feels the same way. Being vulnerable and writing this post! Save email for later. Yes I get between 80-90 emails a day, but again, who cares? Schedule uninterrupted time to complete the email tasks when the building is less occupied. Reduce meeting time by 20%. I have a lot of meetings in my office that can range from 45 minutes to an hour. I need to streamline these meetings to allow more time out of my office. Continue with the feedback cards. I started this on January 15 and I have been able to distribute about 30 cards. It has forced me to respond to staff about what I saw, what I wonder, and to acknowledge the great work going on in their classroooms! Connect with staff and students beyond the walkthroughs and observations. Ask questions, listen, be present! I am excited about addressing these issues and more importantly sharing them with you. What advice do you have? What are some struggles you would want to share? Be sure to comment so we can get better, together. I recently had the opportunity to attend the 11th Annual National SAM Conference. 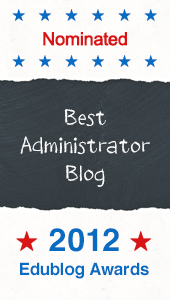 SAM (which stands for School Administration Manager) is a process to ensure that School Leaders increase their instructional time in their schools. The program was created by Mark Shellinger who was a former teacher, principal and superintendent. This was my second SAM Conference and I am in the second year of working with the program. I know I need to do a blog about how crucial SAMs has been to my leadership but for now I will just focus on the conference. SAMs is inclusive! The SAM conference is one of the only conferences that secretaries and school leaders attend together. The idea behind SAMs is to increase instructional leadership at all levels. SAMs is innovative! 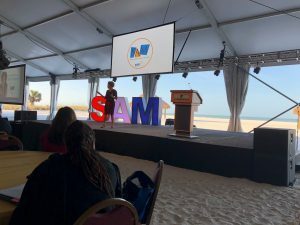 All of the keynote sessions were in the sand on the beach at Marco Island Marriott Resort. I can honestly say I have never imagined listening to speakers with my feet in the sand. In addition, this year at the conclusion of the conference we had a “choose your own adventure.” There were three speakers to choose from at the same time (LaVonna Roth, Willow Sweeney, and Ken Williams) and with a headset you could listen to one or toggle between the three. SAMs focuses on listening! One of the best workshops I went to was on Deep Listening by Kirstin Olson. We learned techniques to become better listeners for our students, staff, parents and community members. SAMs focuses on Professional Development! I received 6 books at the conference. Marc Shellinger made sure that we received all books from the Keynote speakers. I now have a long list of reading to do! Here are a list of the books we received: The Big Disconnect by Catherine Steiner-Adair; Successful Women Think Differently by Valorie Burton; Visual Intelligence by Amy Herman; Crucial Conversations by Joseph Grenny; 17,000 Classroom Visits Can’t Be Wrong by John Antonetti. SAMs is about networking. Throughout the conference I worked with educators from throughout the country. I met colleagues who were able to share ideas with me and challenge my thinking. This was such an amazing conference. 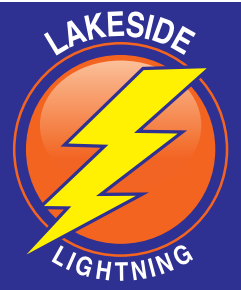 I am re-energized to improve my daily practice as a Principal at Lakeside Middle School. I am prepared to be a better listener and encouraged to take chances to improve my leadership! I am not setting any New Year’s Resolutions. I haven’t joined anything new, or set out on any new adventures. In year’s past, I have set and achieved New Year’s Resolutions (Blog 365 Challenge, ran a marathon, and lost weight). I have also set and failed to follow through on countless New Year’s Resolutions (way too many to write about). This year I saw something interesting on Twitter… What is your “one word” for 2018? I thought that sounded interesting and achievable. 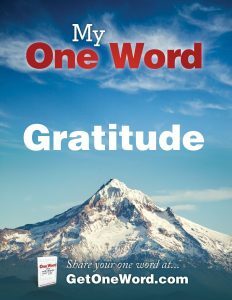 So, I chose the word GRATITUDE. 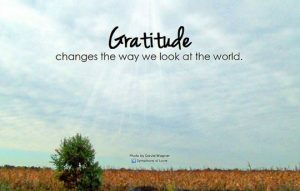 If you have been reading my blog, you will have seen a lot about gratitude. It really has become something essential in my life. No matter how difficult or trying the day has been I can always find at least 5 things that were good, positive, worthwhile, and even excellent. Why not continue with it? 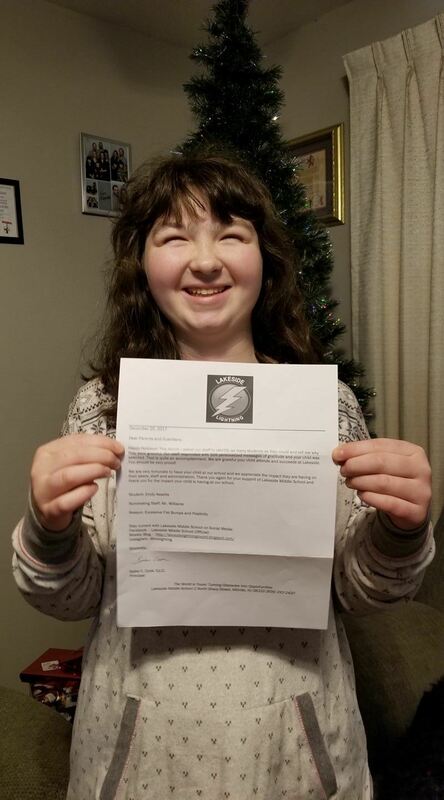 When you get a chance…. tell me something good!